Protecting your netbook doesn't mean that it has to be dull or boring. This beautiful neoprene netbook sleeve case allows you to protect your netbook while expressing yourself! With matching zippers and lining, this sleeve takes close note to every detail. 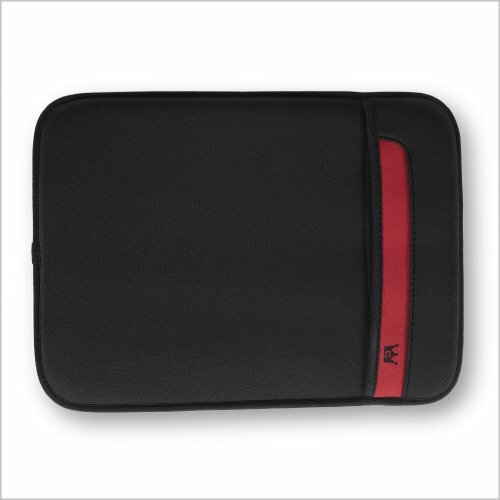 The durable neoprene will protect your netbook from scratches, dust, fingerprints, and damage. Easy to insert and take out your netbook with the dual zippers and the slim, lightweight design! Stays secure with the form fitting neoprene material and fold over opening. Easy top slip slide in opening made to be scratch-free! I have been searching for a sleeve to carry my Chrome OS Notebook (CR-48) in since I got the laptop. My search is over. This sleeve fits the notebook perfectly. Snug fit, but I love it! No more awkward sized cases for this little notebook that make it look huge. Doesn't add much to the overall size, considering how protected it makes it. Great case! Arrived very quickly and fits snugly on my ASUS UL-20. It has a flap towards the top under the red part where you slide in your laptop, there is no zipper which is kind of nice but takes some getting used to. Overall i am very pleased with it. I would definitely recommend this case. Fits the Samsung Series 5 Chromebook wonderfully. Keeps the scratches away, while not adding too much bulk. Plus, it is just plain sharp looking.